Winter is coming faster than the final season of Game of Thrones -- and with mercifully fewer decapitations and White Walker attacks. Embrace the chill, revel in the snow, give into the cradle of a puffy coat, and hit the road for a day trip to a farm where you can cut down the Christmas tree of your dreams. In addition to Spruce, Fir, Fraser, and Balsam trees, many farms also offer hot chocolate, warm apple cider, snacks, bonfires, wine tastings, and horse-drawn wagon rides. Most of these spots are less than a two-hour drive from the city’s most famous Christmas tree, and the trip will get you into the holiday spirit faster than George R. R. Martin kills off primary characters. Payment policies vary, so hit the ATM before you round up your reindeer and head to the best Christmas tree farms near New York City. This Dutchess County farm is open for the season on Friday, Saturday, and Sunday from 9am to 4:30pm. Sharpen up that blade and get to hacking on any Spruce or Fir tree under 8-feet for $55, or choose from fresh-cut trees up to 14-feet tall for $40-$150. Bolster your holiday decor even further with the farm’s handmade wreaths, kissing balls, and table arrangements. After your visit, refuel with a house-made sausages and freshly brewed Kölsch at Mill House Brewing Company, about 10 minutes away. 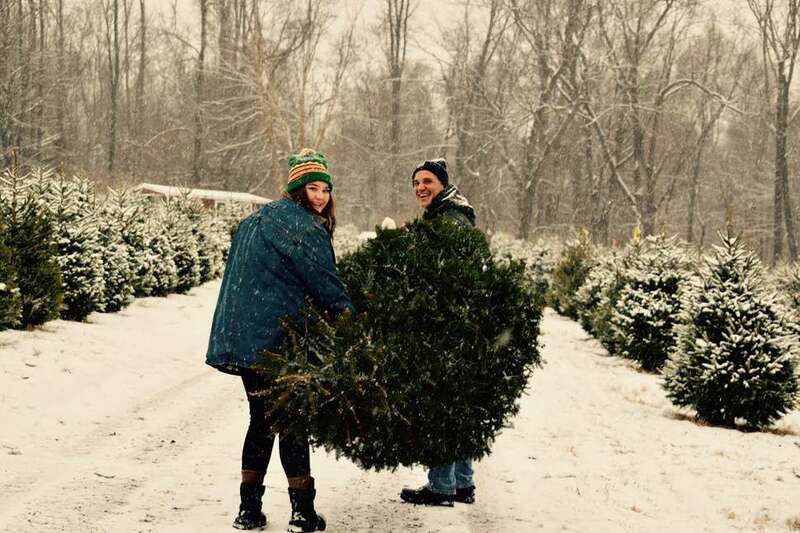 Family-owned and -operated for more than 30 years, this Hudson Valley farm offers a variety of cut-your-own and fresh-cut Christmas trees, ranging from about 6-12 feet starting at $45. Harvest a Spruce, Fraser, or Balsam beauty, or pick and pack a pre-cut evergreen from 10am to dusk on weekdays and 9am to dusk weekends. Enjoy complimentary roasted chestnuts, mulled cider, donuts, and a bonfire on Saturday and Sunday, when they’ll also bundle your selection and secure it to your vehicle at no additional charge. Get there early and take a detour to Woodstock, which is only about a half-hour away. Whether you’re seeking traditional flora ($9 per foot) or a neon-hued dazzler ($12 per foot), Wyckoff’s will accommodate any holiday palette. 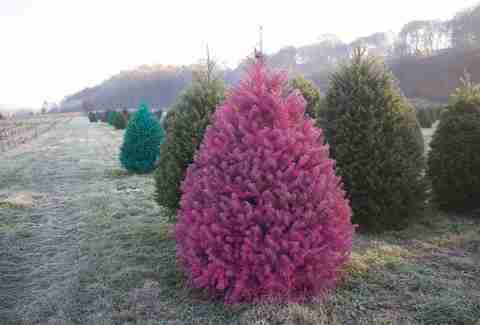 Pops of pink, purple, magenta, or turquoise-painted novelties stand out among Fir, Pine, and Spruce standbys. Load up your begged, borrowed, or rented car with plenty of snacks and (road safe!) sips before the journey so you can partake in the farm’s tailgate parties from 8am-4:30 pm on weekends through December 22. Cut your own tree for $85-99 or simply choose one for $75-95 before you pay a visit to the farm’s markets for freshly baked pies, doughnuts, candy, holiday decorations, and hot apple cider. Schedule your visit on Saturday or Sunday afternoon to take advantage of a tasting at the on-site winery. Choose from five needly varieties at this family-owned farm northeast of Trenton on weekends from 9am to 5pm. All trees under 12-feet are $55 and all trees over 12-feet are $120. They’ll also shape your tree’s trunk, wrap it, net it, and tie it to your car at no additional cost. 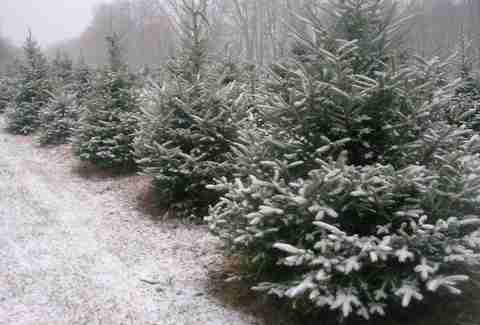 Fresh cut Douglas Fir, Fraser Fir, Norway Spruce, and White Spruce trees range from $25 to $65 at this Hudson Valley Farm -- or you can raze your own for $55-$65. Trees range in size from about 4 to 12 feet and you can tack on a 22’’ wreath for $25. The farm is open on weekends from 9:30am to 4:30pm through December 17. While you’re in the area, visit the nearby Millbrook Vineyards & Winery for a tour and wine tasting. The Tilden family has owned and operated this Long Island farm for 225 years. The cut-your-own stock here is limited this year, so go early in the season, or choose from their pre-cut Fraser Firs. Trees range from $70-$80 and handmade wreath prices drop from $30 to $20 with purchase. Tilden is only open for four more days this season: the weekend of December 1st and the weekend of December 8th. Allow plenty of time for a detour to Old Fields Restaurant for dinner (try the Duck French Dip) and a cocktail. Wander through the Jones family’s 200-acre homestead farm and search for your perfect tree, or pop by their barn for one that’s been freshly cut. Cut-your-own trees average about 8 feet and cost a flat $72, which includes a commemorative pewter ornament. Fresh-cut trees are priced by size, and range from 2-14 feet. The farm is open daily from 9am to 5:30pm and has a winery on site. This is the full Christmas experience, with Santa cameos, free horse-drawn wagon rides on the weekends, plus hot chocolate, snacks, handmade wreaths, and a gift shop that sells Christmas decorations. Their Douglas Fir, Balsam Fir, Fraser Fir, and White Spruce all run $75. The farm is open daily 8am to 4pm through mid-December. This is the place to be for unique tree species. 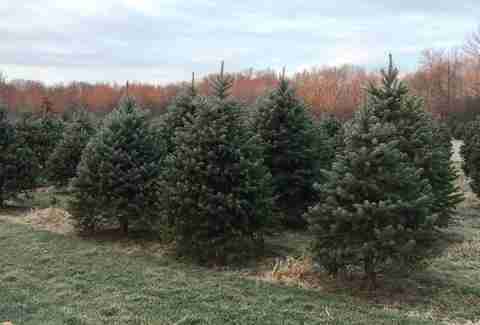 Emmerich has the usual Frasier Firs, plus 12 other varieties for around $10-12 per foot (pre-cut trees range from $80-$130). Included in the trip: complimentary hot chocolate, wagon rides, holiday music, and a free wooden ornament (with the purchase of a tree). The farm sells wreaths, decorations and tree stands, and provides baling, drilling and loading services. It’s open on weekends from 8am to 4pm. 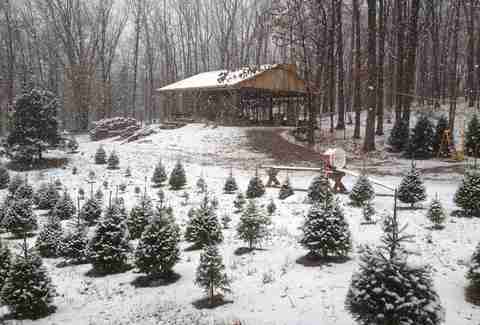 This quaintm family-run farm offers Fraser Fir, Douglas Fir, Balsam Fir, Blue Spruce, and Norway Spruce, some as tall 12 feet, all for a flat $55. It also has tractor-pulled hayrides to bring you to the tree fields (and will bring you and your tree back to the barn) and complimentary hot chocolate and freshly baked cookies. Free wagon rides, free hot chocolate, free marshmallows, and a bonfire bolster the shopping experience at Hidden Pond, open Tuesday to Sunday from 9am to 5pm. 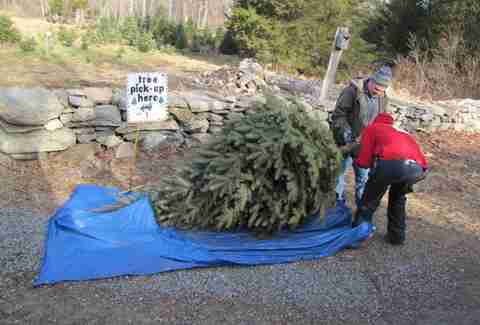 Cut-your-own trees reach 6 feet and cost $50, and fresh-cut trees start at $65. Stop by the Black Horse Tavern & Pub for a tavern burger on your way home. Caroline King is a freelance writer based in Buffalo, NY who may or may not be currently researching the best ways to get tree sap out of hair. Follow her on Twitter @kingceliza, or check out her travel blog.